Bundled up for our hike! By the time November arrives, I usually am retiring my hiking shoes for the year since snow and ice don’t mix well with a titanium femur and knee. I’m pleased that while the cold temps have arrived, the snow and ice are still on the horizon. 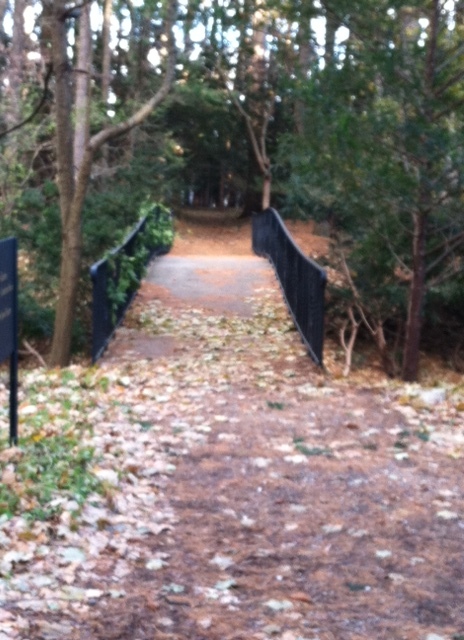 This gave Justin and me an opportunity to enjoy a hike through one of my favorite campuses this past weekend. It was a sunny, dry day when we arrived at Cranbrook Educational Community in Bloomfield Hills. Temps were in the high 20s with a brisk wind but we dressed in layers and looked forward to the fresh air as we explored the historic campus. I love Cranbrook. It mostly stems from working in the public relations office for almost five years, but even before that I loved how the campus blends science, nature, education and art so seamlessly. If you’re not familiar with the history of the area, here’s a brief overview: Cranbrook was founded by George and Ellen Booth in the early 1900s. George, a steel magistrate, and Ellen, of the Scripps newspaper family, loved art, science and education. They were instrumental in bringing major works of art and architecture to the Detroit area and eventually purchased 174 acres in Bloomfield Hills to build their summer estate (purchasing more acreage as their plans expanded). They worked with renowned architects, including Eliel Saarinen and Albert Kahn, to create their manor home and later key buildings, such as Brookside (elementary), Kingswood (girls) and Cranbrook (boys) Schools, the Institute of Science, Art Museum and Academy. While I especially love driving through campus during spring and fall, it really is beautiful throughout the entire year. Deer are often spotted, and this particular day we saw ducks, swans, geese and many squirrels. The campus appeared almost devoid of people (most likely from the brisk temps! ), although many cars filled the Institute of Science parking lot. Those were smart (inside a warm building!) people exploring Dinosaurs – The Lost World exhibit (see my previous blog to know how great that is), visiting the Bat Zone or being adventurous in a planetarium show. We parked near the science museum, then cut down a trail by the stegosaurus. The Institute of Science hosts a very popular annual Maple Syrup Festival in the spring so I am very familiar with the trails and trees near that area. The campus balances the public venues, such as the science and art museums, with the private schools so one has to be thoughtful (and knowledgeable) in where you should follow the trails. The one past the stegosaurus leads down to the facilities used during Maple Syrup Festival or along the side of the new girls’ middle school toward Kingswood Lake. As we walked along the lake, I was pleased to have some facts and stories return from the depths of my memories. Justin kept me on my toes with questions, although I finally admitted my history of the campus had weakened in the many years since I worked there. My excuse was I primarily worked at the Institute of Science so my knowledge was much stronger in that area! I still love the Institute, love visiting and love catching up with former coworkers. It still ranks as my favorite place to work. As you walk along the lake, beautiful Cranbrook House comes into view. I recalled some days walking from the Institute to Cranbrook House for PR department meetings. The fresh air and quiet walk always cleared my mind and often brought new ideas or eroded writer’s block. Cranbrook House – pretty even in the cold. Cranbrook House is one of metro Detroit’s oldest surviving historic manors. 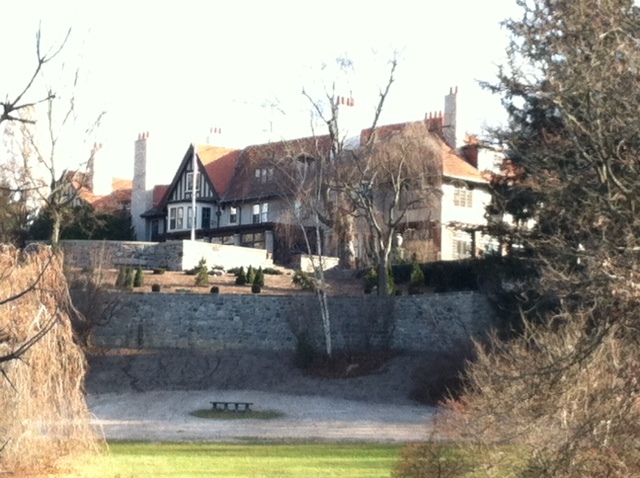 The Arts and Craft style home was designed by Albert Kahn in 1908. The upper floors are currently used as administrative offices, while the main floor is preserved to show the amazing architecture, tapestries, art and more. During the summer, the 40-acre gardens surrounding the historic home flourish with bright colors and lush greenery, sculptures, and running fountains. Even without the blooms, it was fun to walk through the gardens. There are many sculptures to be found when wandering, and we marveled at the views the Booth family and their guests had when the house was lived in. All of course show signs of aging but a good job has been done to preserve the pieces as much as possible (however, Mother Nature can be tough at times). We cut toward the amphitheater, laughing about being on stage, then found a trail that took us near the Art Museum and Academy. Justin has never been to either so we walked along the buildings to view the Orpheus Fountain and Saarinen House (the Art Deco house was designed by Finnish-American designer Eliel Saarinen in the late 1920s). There are several great tours available to the public interested in learning more about this unique gem. Tours of Saarinen House are offered May-October; the Art Museum offers several tours through the collections, and a self-guided tour of the campus sculptures; the House and Gardens tours have both guided and self-guided tours; and other special tours are available throughout the campus. Despite the cold temps, we stayed warm in our layers and had a very enjoyable day. I was happy to explore the campus with Justin, letting him see why I loved driving into work throughout the year. And if the temps are too cold for wandering outside, there is plenty of do inside the warm buildings of the Institute of Science, Art Museum and Cranbrook House.